Maybe you’ve had an injury or a sprain, perhaps a hurt child needs to soothe a boo boo, someone might be recovering from surgery. . . When you find yourself needing an ice pack, why not Make Your Own? 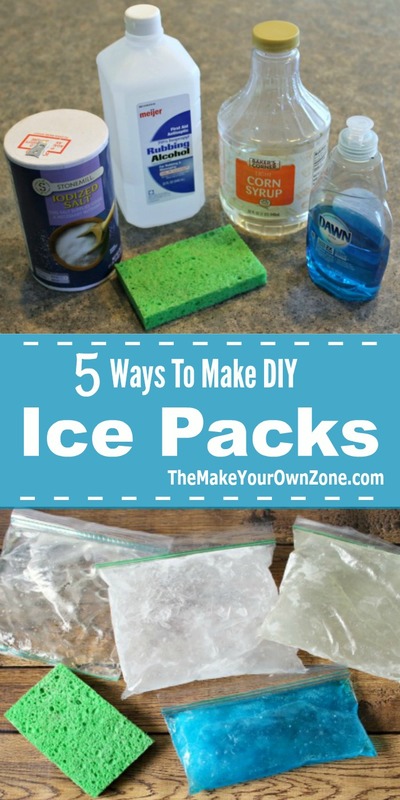 I’ve got five easy ways that you can make a homemade ice pack and they’re all easy to do with using common household items that can be put in ziploc bags and then popped in the freezer. If you want a little extra security against leakage, you can also double bag your ice packs by putting the ziploc bag inside a second ziploc bag, with the zippered side facing down toward the bottom. And one of the methods is even easier – just use a wet sponge! Corn syrup (such as a brand like Karo Light Corn Syrup ) makes an excellent gel type of ice pack. It stays nice and squishy and flexible and doesn’t change texture or color in the freezer. It also contains nothing harmful if it would accidentally puncture or leak in a lunch, aside from things getting a little sticky. It can be made using any size ziploc bag. 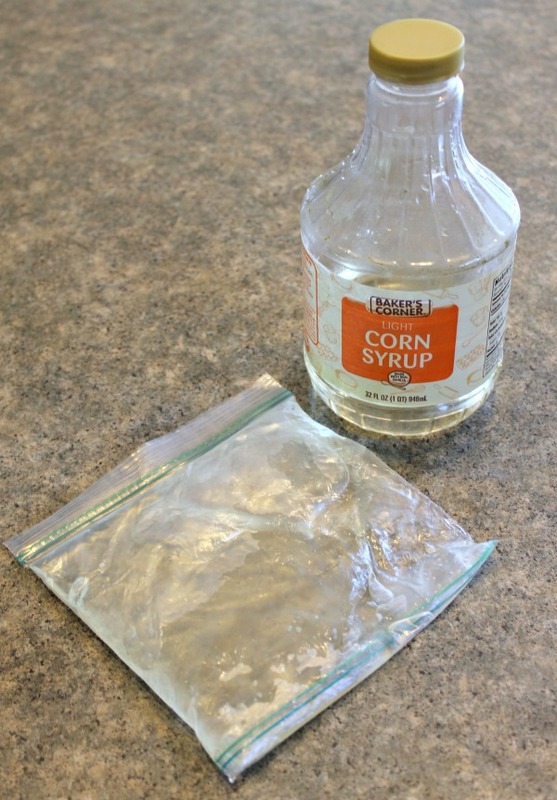 Simply pour some corn syrup into the bag, seal, and put in the freezer for several hours. This is my favorite method for making a homemade ice pack and I keep one in the freezer all the time. It’s especially good for injuries because it stays flexible and can be molded around ankles, knees, wrists or other sore areas. 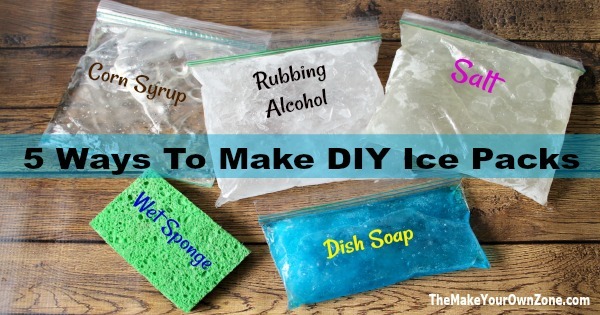 Dish soap can also be used to make a simple homemade ice pack and depending on how long you leave it in the freezer, it can be more gel like and flexible or firmer and icier. I prefer to take it back out of the freezer after just 2 hours because then it will still be flexible and squishy (much like the corn syrup). If you leave the dish soap ice pack in the freezer for longer than a couple hours, it will be much more icy and firm. So the time frame for this method is more important, depending on what type of ice pack you want. 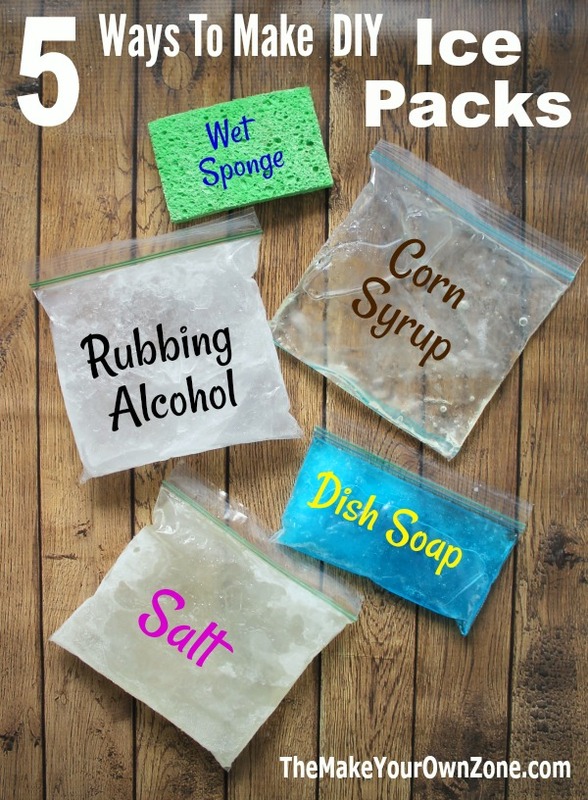 Either way, it’s a simple method that can be made in any size ziploc bag by just pouring in dish soap. No measuring is needed. 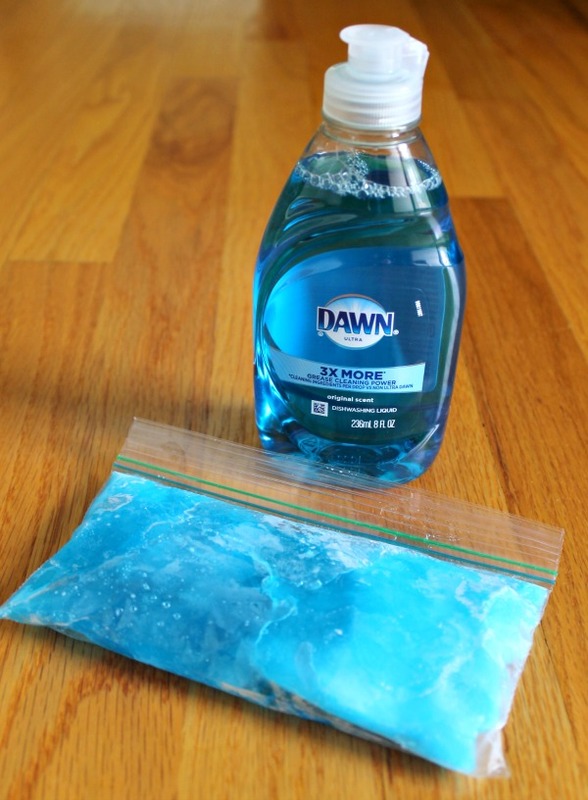 I’ve tried this method with both Dawn dish soap and Ajax dish soap which both worked well, and I would think that other brands of dish soap should work for making an ice pack too. The addition of alcohol to water will keep it from freezing completely which makes it an easy way to create a homemade ice pack. 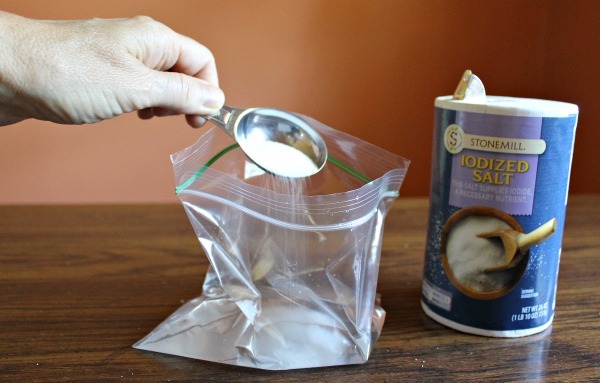 To make this method in a quart size ziploc bag, combine 1½ cups of water with a ½ cup of rubbing alcohol. Seal and put in the freezer for several hours or overnight. 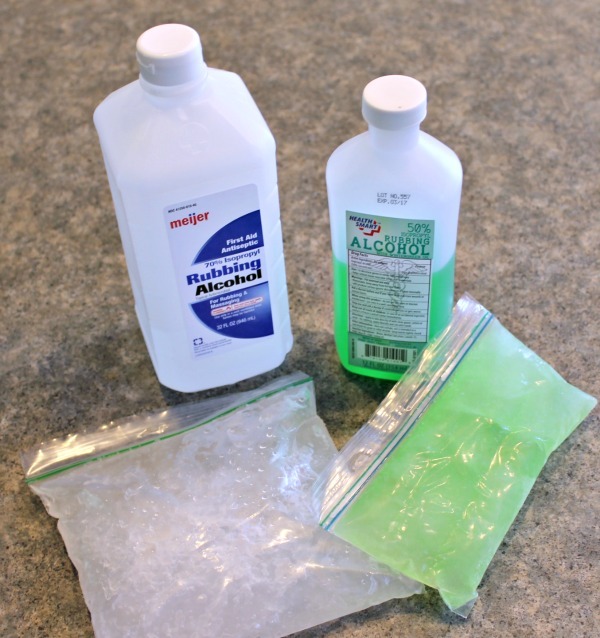 Sometimes you can also find a Green Colored Wintergreen Rubbing Alcohol which gives the ice pack a little bit of color. I made this version in the smaller snack size ziploc bags and simply cut the recipe in half, combining ¾ cup water with ¼ cup of the rubbing alcohol. – You can freeze the small packets of ketchup or other condiments from fast food restaurants for teeny tiny ice packs for the little ones. – For a quick and easy cover for ice packs, check out my previous post about homemade heating pads and ice packs. I’ve found that the felt bags that come with Crown Royal make perfect ice pack covers for the ziplock bags. I have been using the water and alcohol ice packs for years. I have had 19 surgeries and 10-11 of them have been bone and joint fusions/replacements.With knee replacements and major foot surgery, you will use ice a long time – I had major foot surgery almost 8 months ago and still need ice if I have a day where I sit too long. We always make 2 and they keep for months of daily use. We wrap in a hand towel or dish towel before using as they are really cold. Thanks for an interesting page. I’m hoping to try one of these methods, to make a better freezer pack out of some cheap plastic pocket flasks. The idea is that I want something that will give me maximum cooling when I put the “flasks” into a small cooler to keep the contents colder as long as possible. Salt sounds like a good idea because I’d hope that even if it stays in the freezer for several days, it would never break the container. I wonder if the other methods would cause a stiff container to possibly burst. If anyone has any info, which of these five methods would lose their coldness at the slowest rate? I am a school nurse and want to make ice packs that can be disposed of safely after use. The corVicm syrup seems good as it stays soft, but concern for it puncturing? The corn syrup version of these ice packs is definitely my favorite for using on injuries. I’ve never measured the corn syrup when making these and just put enough in so that the bag feels somewhat filled and squishy when laying flat, but not so full that it is stretching the bag to capacity. I just use the ordinary everyday sized ziploc bags when making these too. Try using a food saver or other vacuum sealing machine. The plastic is much surdier than ziplock bags and the seams are safely sealed. They can be defrosted and refrozen over and over again. Or, if you don’t wish to reuse, just slice the top off the bag, empty the contents in the sink amd recycle the bag. The bags may be washed in the sink or the dishwasher and reused/resealed if you wish. Thanks for the ideas I didn’t have a sponge so I used a washcloth instead and it works. To make a gallon baggie from dish soap, will I only use dish soap or mix with water? It would probably work best if you just use dish soap. You could try diluting it a bit with water but remember that the more water you use, the more likely it will freeze harder as water freezes more solid. Amazing ideas !!! I am 100% going to make a bunch tomorrow ? Thank you for the suggestions ! I know you’ll find these homemade ice packs to be very useful Natasha! How long does the corn syrup ice pack take to melt. How long would it last? Whenever I have used the corn syrup ice packs it has been for icing an injury. The corn syrup ice packs are very cold, but still flexible and pliable. So when they warm up, they don’t really melt. They are just not cold anymore and a bit more squishier than before. I would say it takes about an hour before you notice it is not very cold anymore and it needs to go back in the freezer. Which method gets coldest? Has anyone used a kitchen thermometer to check each one? How long does it take the alcohol ones to freeze? mine has been in for about 5 hours and still no luck yet? Thank you! The alcohol ones will get slushy but will not freeze completely. This should happen after several hours, so I’m kind of surprised that after 5 hours you have not seen at least some freezing. If it continues to not get slushy, try again with a new mixture that uses a little more water, and a little less alcohol (because it’s the alcohol that keeps it from freezing). No, it shouldn’t matter, both should work. I did a science fair project on this and I found that 100 mL of dish soap and 75 mL of H2O works the best. The melting average is the best. Cool science project. What ice pack fillers did you compare? I have my flours tripple bagged and frozen. I have found it is an excellentt ice pack. And no condensation. Well, I have never used them for that exact purpose but I think they would work because they are icey cold when you take them out of the freezer and are just as cold as any other ice pack you might use. I LOVE the ketchup packets for ice packs! Such a good idea! As a reply to the “or you could just shop at the dollar store comment”….I am currently recovering from surgery and need another ice pack. I can’t go to the store so this is better. That’s what I like about homemade solutions too Annie. Sometimes you need to make due with what’s on hand rather than being able to shop and that’s when DIY solutions come in handy. Well said, Beverly. “A penny saved is a penny earned”. Some of the dollar store dish detergents contain more water than Dawn. More water makes it more kcy and therefore freezing solid. On my ice packs I use the different size zippered curtain panel bags over my zip loc bags.I also dampen an old hand towel dipped or sprayed with rubbing alcohol. I freeze several different sizes.you can scrunch it up before using.last a long time. I use these in my cooler. Keeps things very cold. Just put them back in the freezer and ready to travel again. I do double and triple bag the ice packs. Keeps bottle waters very cold. Do you know if you could soak the sponge in the alcohol/water solution for a less firm result? 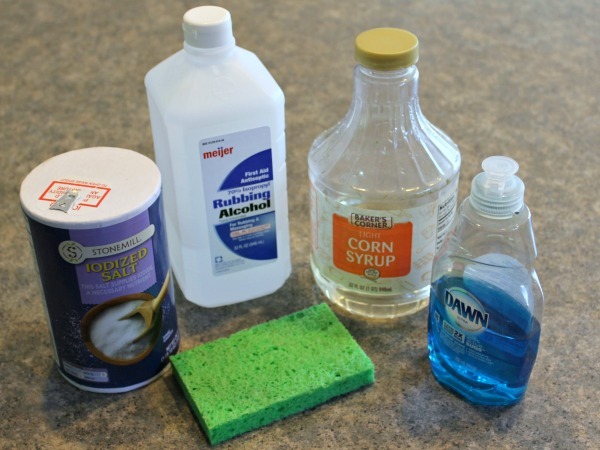 Meagan – I’ve never tried an alcohol/water mixture with a sponge so I’m not sure how that would work. My first thought was that alcohol evaporates quickly so a sponge soaked in this mixture would probably have to be in some kind of a container or the alcohol would just evaporate away. This might defeat the purpose of using a sponge. Do you know which of these pack will stay cold the longest? They all seem to stay frozen for about the same length of time. Hello! Can you advise how long that is? I need them to stay VERY cold at least for an hour! Thanks for getting back to me!!! I would think you would get at least an hour out of these ice packs. I often use mine in an insulated bag and they last that long, but of course the insulated bag helps things along. I use my food saver to make ice packs for the kiddos. Great to see all the possibilities in one spot. I am making ice packs up for a team so the Rubbing Alcohol method is appealing because of the cost saving. Thanks. I tried the salt method and rubbing alcohol method last night. I also tried straight hair gel. I heard you could make an ice pack with hair gel. It froze solid and is not flexible at all. I’m wondering if it’s because the one I got didn’t have alcohol in it. I believe hair gel typically has alcohol in it. Also, I wonder if pancake syrup would work. It’s cheaper than corn syrup. Sfrancisk, if you need to make lots of them, I’d go with making the salt ice packs. While rubbing alcohol is cheap, salt is cheaper and you don’t have to utilize nearly as much salt (2 tablespoons salt : 2 cups water) as you do rubbing alcohol (1:3 ratio – 1 cup rubbing alcohol : 3 cup water), which makes it extremely cheap. Could u explain if the salt ice pack gets hard ir stays flexible?? The water/salt ice pack combo does stay somewhat flexible because the salt keeps the water from freezing solid. It’s kind of like “slushy” ice. Or you could just buy them at the $1.00 store. Well that’s true, but what fun would that be? 🙂 I do my share of shopping at the dollar stores too, but I also like having alternative strategies for those times when I want to use what I have to make what I need. True, that and if you have to use other people to do all your errands for you, this is something you defiantly want done right! I work for two different chiropractors, and have had to purchase ice packs for a number of orthopedic issues in my life. Sure, for an emergency, a $1.00 break and squish instant ice pack can be fine, but for chronic inflammatory conditions, sometimes you need a larger overall, our something heavier. I can attest that a QUALITY ice pack purchases from a store that is large enough for orthopedic applications (especially for while rotator cuff inflammation our low back pain) is going to run you a MINIMUM of $20-$30. And as anyone who uses them frequent will yell you, it’s good to have spares, so rather than spend $60 for a couple ice packs, why not pay $20 total and make quite a few? This is an excellent way to save money, and if one punctures, you can just change out the Ziploc bag! But, we love the idea of the malleable ice packs and our dollar store carries only the hardpack. So true! 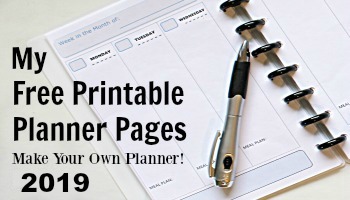 All these ideas are super easy to do with things you probably already have around the house. Hi! Great article. I want to make these gel ice packs to cool my insulin while on travel. How long before they melt or lose their cool? Thanks! You should be able to get at least a couple hours of cooling out of these ice packs, however it could be more or less depending on the temperature of the conditions you are using them in. Also a very good idea when you’re road tripping it in an RV. I use the small bottles of alcohol pour about half in a zip lock bag and add water to the alcohol bottle. Stays very cold. The Zip locks will leak a little after a while the alcohol bottles last a long time. I have had hambu Still frozen even after 5 hours. Thanks so much. I have arthritis in my shoulder, and I need a chill pack, but ice is too cold . I made the corn syrup pack with my FoodSaver and some expired syrup (eew) I found in the back of the pantry. I keep it in the fridge for after PT. Terrific! I LOVE this idea! Definitely going to be doing this! Ooh! I love these! What a great idea to use the Zip Lock bags! I will be featuring your ice packs at my Super Link Party on Wednesday!